The Human Body Exhibition returns to Dublin today, opening for a three month stint at the Ambassador Theatre on Parnell Street. The controversial exhibition features preserved human bodies, modelled to reveal the true complexity and beauty of this wonderful machine. The 200 specimens, spread over nine galleries, provide insight into how the human body functions and how it is affected by lifestyle choices, such as smoking and overeating. The exhibition is designed to educate, encourage and enlighten, often displaying the physical damage caused by neglecting your body. One display starkly reveals the differences between a pair of healthy human lungs and those of a regular smoker. The exhibition travels all around the world and where it goes controversy always follows. There has been criticism over the source of the bodies - nearly all are "unclaimed" bodies of Chinese citizens and there has been some suggestion that some of the bodies were those of Chinese prisoners. 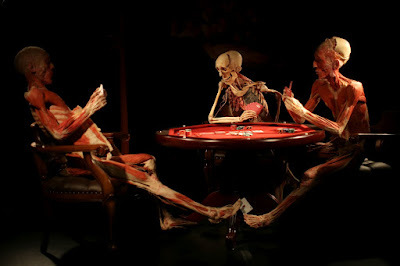 According to the exhibition curators, Dalian Hoffen Bio-technique Laboratory, all the bodies are "legally donated". The preservation technique is very interesting indeed. Using a process called plastination, the body water is removed and replaced with a liquid silicone rubber that is treated and hardened. The end result is a rubberised specimen, preserved to the cellular level, showcasing the complexity of the body’s many bones, muscles, nerves, blood vessels, and organs. The full-body specimens can take over a year to prepare. The exhibition is deeply controversial but one cannot deny its educational potential. It will foster an appreciation of the complexity of the human body amongst the young and old, and hopefully spark a debate around ethical issues in science and technology. The exhibition is open daily, from this evening. Ticket information on Ticketmaster.ie.